In recent months, Israeli leaders have stepped up their rhetoric about Iran’s nuclear capabilities and increasingly are warning that Israel might attack Iranian nuclear installations to prevent Tehran from developing a nuclear weapon. Lately they are warning that such an attack could come this year. This is sparking widespread debate in Israel, where memories are still vivid of missile attacks on the country two decades ago during the Iraq war. Lawyer Moshe Meiron, 86, sits in the living room of his house in the Tel Aviv suburb of Ramat Gan. He was deputy mayor of the town when Iraqi President Saddam Hussein, under attack by a coalition of Western and Arab states because of his invasion of Kuwait, 21 years ago launched Scud missiles against Israel. Meiron recalls the night after a siren alert when he was huddled with his wife in a safe room, wearing gas masks. A missile struck their car parked in the driveway nine meters away. Such memories of retaliation by Israel's enemies have not deterred Israel's senior leaders from warning that they are prepared to attack another country in the region, Iran, to prevent it from gaining nuclear weapons. They say a military attack is a last option but that they are prepared to go it alone if the international community hesitates. Prime Minister Benjamin Netanyahu says a nuclear Iran would pose a global threat. "A nuclear-armed Iran is a threat to Israel, to the region, to the world. Iran must not be allowed to develop nuclear weapons. Period," Netanyahu said. How Israel is planning to stop Iran from doing so has been the subject of a number of media reports in recent weeks. Israeli Defense Minister Ehud Barak recently told a conference of military strategic experts in Hertzliya near Tel Aviv that time is running out for an effective military strike, possibly before the end of this year, and the problem must be dealt with soon. Experts say Tehran is moving important nuclear facilities into an underground fortress that is not likely to be seriously damaged by even the heaviest bombs. Iranian leaders deny any intent to make nuclear weapons and say their nuclear program is for peaceful uses: power generation and medical research. But Iran has warned it would retaliate for any attack. 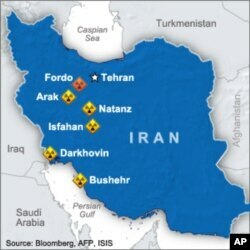 Tehran possesses ballistic missiles that can reach Israel and as far as Europe. 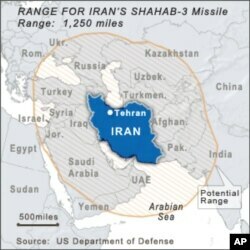 One expert at the conference said Tehran is working on a missile that could reach the United States. Iran specialist David Menashri says the repercussions of an Israeli attack could also de-stabilize the region. Menashri believes sanctions and international pressure should be ratcheted up until the Iranian government agrees to negotiate an end to any nuclear weapons program. The United States and European Union have imposed economic sanctions on Iran, including restrictions on its Central Bank and an embargo on Iranian oil exports, which make up one-half of its domestic product. Iran has responded by saying it will cut off oil supplies to Europe and might block the Strait of Hormuz, a transit point for crude oil exports from other Gulf oil producers. Some analysts believe Israel does not intend to attack Iran unilaterally but is talking about it to marshal public opinion and pressure its allies to enact even stiffer sanctions. But, according to media reports, senior Israeli officials do not believe sanctions will ultimately persuade Iran to abandon its supposed nuclear ambitions. Others, like military history professor Martin van Creveld, say a military attack would only delay Iran's nuclear program by a few years. He says the international community should accept that Iran will one day acquire a nuclear weapons capability. "There is the possibility that the Iranians will say, look, this nuclear business is causing us so much trouble let's get the bomb as soon as we can; tell the whole world; and then no one will be able to touch us," he said. But allowing Iran to develop a nuclear capability would be a disaster, according to other analysts, such as Ephraim Kam of Tel Aviv's Institute for National Security Studies. Even if Israel launches a military strike against Iran, critics say it does not have the capability to successfully destroy Iran’s nuclear installations.They note that attack planes would need to refuel to reach Iran, 1,000 kilometers away. And they would need some kind of agreement to fly over Iran's neighbors. While U.S. President Barak Obama says Washington will not tolerate a nuclear-armed Iran and that all options are on the table, U.S. officials have urged restraint to allow the sanctions to work. Public opinion surveys show the Israeli public is divided over attacking Iran. In a recent poll, 43 percent of respondents said they support an attack, while 41 percent said they oppose it. However, nearly two-thirds of the respondents (62 percent) said they believe Iran will eventually develop nuclear weapons. On a street in Jerusalem, salesman Jonathan Fisher believes war is inevitable. "Of war, I'm sure about it," said Fisher. "A war in Israel is just a matter of time. It will surely happen. When? I do not know." Recent immigrant Pascal Roy says he feels safe in Israel. "I wish there was a compromise before reaching," said Roy. "I'm totally opposed to a military attack before talking." Student Oriyana Spitzer, 14, is worried about the future. She wants a peace that will allow people to live together with no more wars. Yaniv Shemesh was 14 years old when a Scud missile hit his apartment's neighborhood in Ramat Gan 21 years ago, wounding dozens of people. He still suffers from the trauma (Post Traumatic Stress Disorder) and cannot work. He says he has nightmares, nervousness and tension. He avoids leaving his tiny apartment and anything that reminds him of the attack. He says he is obsessive and suspicious. Like many Israelis, he hopes the confrontation between Israel and Iran will not go beyond saber rattling.